*** Stop Press *** Plus Markets have changed their website and their story 24 hours after notifying the world of these trades! See note at the bottom of the blog post. 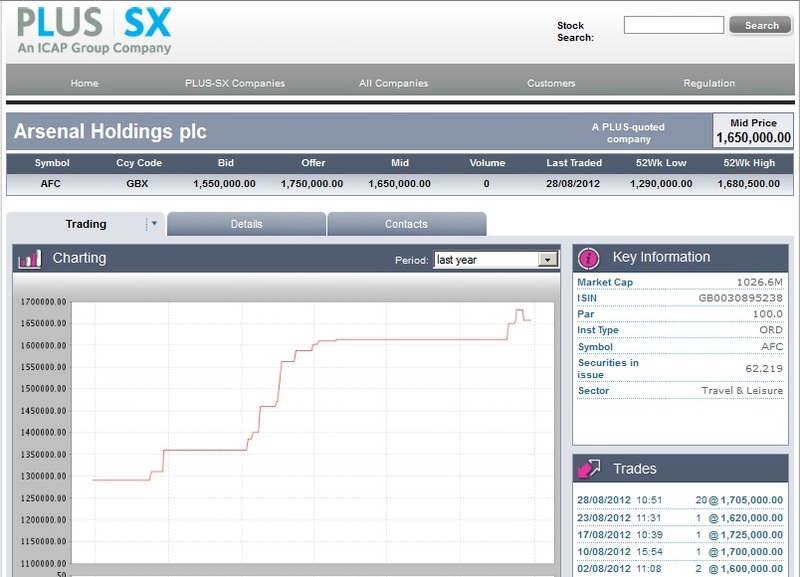 On 28 August 40 Arsenal shares were traded on Plus Markets, 20 at £17,050 each and another 20 at £17,150 each (the record high price is currently £17,250 per share). The reason this is worth talking about is that trades of more than one or two shares at a time are unusual these days – the last time 40 or more were traded in a single day was in October 2011, the time before that in July 2011. Recently as few as three shares have been traded on Plus Markets per month. At the moment we don’t know. We know for sure it’s not a member of the Arsenal Board (of which only Stan Kroenke currently holds any shares), as Board members must make a public declaration via the stock exchange when they buy or sell any shares in their own company. There is of course a prime suspect as a buyer: Alisher Usmanov. For reasons best known to himself (see here and here) he still seems to want to get to a 30 per cent shareholding. He admits to owning 18,496 shares, though there are suspicions that he is in control of others that might – with the addition of these 40 – take him over the 30 per cent figure of 18,666. If the buyer is Mr Usmanov, through the vehicle of Red & White Holdings, then it will be interesting to see whether he owns up to the purchase, or hides it under a nominee account name on the shareholder register. As I’ve said, there are – or were at the end of July – 8,062 Arsenal shares currently held under nominee names, while there are 10,592 in the name of Red & White Holdings. That’s a total of 18,654, so before today it appears that even if all the nominee-held shares did in fact belong to Mr Usmanov, he’d still be a few short of 18,666. However, with 40 more, he’d be above that figure. So there might be a very interesting announcement soon. Who is selling the 40 shares? There’s a very limited pool of people who still have 20 shares or more. There are Kroenke and Usmanov, of course, and Fanshare. After those there are only ten others with 20 or more shares, and I can rule out at least one of those from personal knowledge. I have a hunch who the two sellers might be from the limited selection available, but there’s little point publicly speculating. So how can we find out for sure who the buyer and seller are? For the buyer: if Mr Usmanov makes an announcement shortly, it’s him. If he doesn’t, then we do the same as for the seller: we wait for the share register to be updated and have a look to see whose figures have changed by the required amounts. The seller(s) will probably be easy to spot, but the buyer may of course be hiding behind a nominee account. I want to know everything there is to know about Arsenal shares and Alisher Usmanov, what should I do? Refer to my previous blogs on the subject. You could start here: Alisher Usmanov Q&A or any of the links in the text above. Well Plus Markets are really screwing my blogging activities. After writing the post above and about 12,000 people reading it, they removed one of the two trades of 20 shares from their website this afternoon (29th). I have spoken to them about this and they told me that basically they have cocked up: they say they entered the wrong price on the trade the first time, but failed to actually delete the first trade when they put the second one in with the correct price. I must say I’m not entirely convinced by the story, as it’s the second one (from 10:53) that’s now been removed, while the first one (from 10:51) remains. 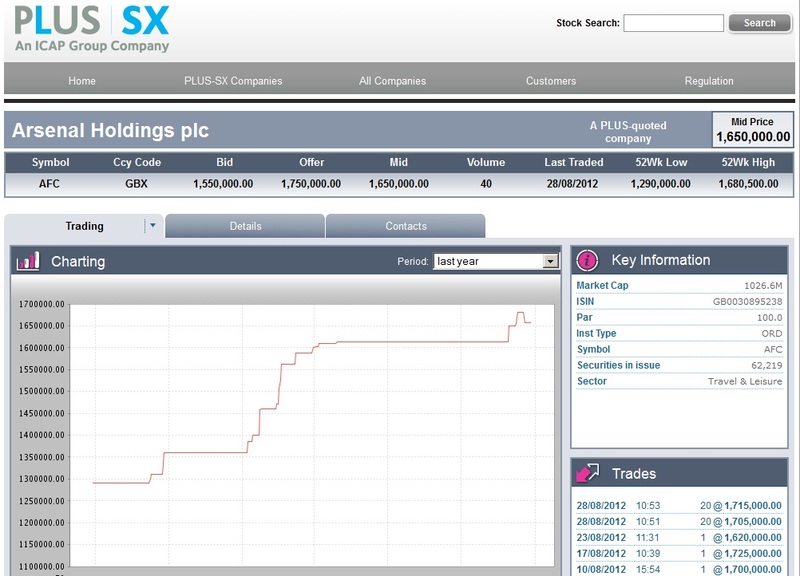 However, it does appear that there was only one trade of 20 shares to report from yesterday. Does that take Usmanov over 30 per cent? It’s still possible – if he was the buyer, rather than a random speculator. Just great blog…keep up the good work! Great news. The sooner Usmanov takes over from the asset stripper Kroenke the better. Can’t come soon enough for me. Kroenke is evil and just wnats to ripen the finances before he sells to Alisher anyway. The only way we’ll get our Arsenal back is to get rid of Kroenke. Fact. of. Life. Until Kroenke sells some of his shares Usmanov will neve be able to take over. Wish I could agree with your theory about Stan wanting to ripen the finances before selling, but to what benefit? If Usmanov has indeed bought the shares and that takes him over the 30% mark he will need to make an offer to buy all the remaining shares – at that point he will need to offer Stan enough for him to relinquish any and the moment he does so he is obliged to offer the same for all the shares. Kroenke is on to a winner if he wants to sell. Sorry to disappoint you, but Usmanov won’t be forced to make a full bid if/when he gets to 30%, the Takeover Panel won’t enforce that in this case. Thank you, that would be the first time that I have read anything relating to Arsenal shares that I actually understand. Very well done. Does that mean it will cost Stan £40m to force through complete ownership? He can afford it, but will he? From a business point of view, buying at the highest price doesn’t make sense. For peace of mind, it probably does? Assuming he buys at £17150 per share it could be over £320m. Once over the 30% mark he will need to offer a Takeover and therefore to buy all remaining shares. If Kreonke were to agree to sell them all……..
See previous reply! And my previous posts on the subject. Sorry, missed a zero – £400m! More than likely that tubby is paying over the odds to take his holding over 30%. Lets hope he launches a hostile takeover bid and puts an end to our prudent financial existence. With fans support he could succeed! How can just 3 words be so funny?! ( bc@11.38 ) – Nice one. People who think Usmanov would be our white knight need their heads read. He can make a full takeover bid any time he likes – 30% or not. Question is whether Stan would sell. Not sure what price Stan bought at, but it certainly was a lot less than GBP 17k. I wouldn’t surprise me if Stan is the one buying a few shares here and there at these inflated prices (under cover of a nominee company), just in case Mr U fancies a takeover bid. At these prices Stan would certainly make a killing and Arsenal FC would be in a deep shitpile. I wish! If I had 20 I’d have sold a few to Fanshare by now. In fact if I had any more than one I probably would, as I could use the money and the shares would still be safe from predators. If, and only if Stan the man is doing as some believe and performing a Glaziers in one form or another and slowly asset stripping, add to that the fact that no-one really knows whether the buyout has been leveraged, at what point of mid table mediocrity would vox populi chant the name Usamanov? We’re guessing that AW won’t renew his contract, so who replaces him and would such a replacement be as diplomatic? My personal opinion is that Kronke is happy to hoover up any shares he can at the moment knowing that in a few short years, with the club getting a large cash injection from new commercial deals, enabling the outstanding debts to be repaid, he can sell lockstock and barrel for a vast profit. I would think a solvent and debt free Arsenal, in full compliance with Uefa FFP might be worth upwards of £25k per share?? Kroenke’s not buying. He’d have to declare every share if he were, and he never says a word. I don’t trust this Usmanov character one bit. I’m happy with things the way they are until FFP comes in. If you think Kroenke is bad, I’d bet this guy is worse, so just be careful what you wish for. I trust Wenger and Wenger alone. If he supports Kroenke, I support Kroenke. I too would be interested in who is the buyer as we will soon have 8 shares to sell. Usmanov is offering 14k each for them so is it him?